Pound for pound, the hybrid striped bass rates right up there with the best of the fresh water fish when it comes to putting up a good fight once hooked. Pound for pound, the walleye is hard to beat for table fare, with some fishermen calling it the best tasting fish of them all. Fortunately for those anglers in this part of the state who like some muscle on the end of their line and tasty fillets on the table, there are plenty of both fish around due to vigorous and well-planned stocking programs. These fish are there ... but you're going to have to work for them. The New Jersey Division of Fish and Wildlife has stocked Monksville Reservoir with walleye on a yearly basis since 1988. Lake Hopatcong has been stocked since 1991 with Swartswood Lake and Greenwood Lake added to the mix in 1992 and Canistear Reservoir and the Delaware River added in 1995. The walleye favors lakes 250 acres or more or rivers with cool temperatures, shallow to moderate depths, extensive shallow areas and plenty of panfish, minnows, yellow perch, alewives and gizzard shad upon which to feed. Bob Papson, a biologist at the state's Lebanon Fishery Laboratory, has been involved in the walleye stocking program since its rebirth in 1988; no doubt spurred on by fishermen returning from trips to Canada with stories of morning catches followed by lakeside fish fry lunches. "We put almost two million walleye fry into Monksville in the first two years it opened," Papson says. "We were getting fry from wherever we could to get the program started because fishermen were starting to ask for them. Now, we're putting bigger fingerlings into our lakes and reservoirs. "We're always trying to provide a diversity of fishing opportunities for our state's fishermen. We want to make it so our anglers don't have to go to Canada or New York to fish for walleyes." Tim Clancy, the stocking chairman for the Knee Deep Club at Lake Hopatcong, says the club has had a sustained stocking program in effect since 1994. "We've gone from almost nothing to great fishing," Clancy says. "Between the state and the club, we put in about 10,000 fingerlings a year. "Fish in the four- to six-pound range are not uncommon. They are a hearty, robust fish and have established a solid foothold in the lake. We are very pleased with the results of the stocking programs... and so are the fishermen." The best walleye fishery in the state is said to be the Delaware River since it is stocked annually by the Pennsylvania Fish Commission and periodically by New Jersey. The state record walleye, a 13-pound, 9-ouncer, was caught in the river by George Fundell in 1993. While the walleye population is growing in numbers and anglers are reporting better and bigger catches, the fish is not going to just jump into your boat or frying pan. You do have to work for them. The best time for catching walleyes is during the "magical three hours" of a fisherman's day "the hour and a half before daylight and the hour and a half before dark. "Walleyes feed in very low light conditions, thus the best success in the early morning and early evening hours," Clancy says. "Rainy, cloudy days are good as are days when there is a good chop on the water. Many anglers say the best walleye fishing is at night. "You can find them in the shallows in the cooler weather and then as the water warms, they'll head to the deeper water in the main lake at Hopatcong." Walleyes can be anywhere from finicky to downright uncooperative at times and most anglers have have their favorite jigs, spoons and other lures of different sizes and colors to use depending upon conditions. Bill Clark, a trustee at the Knee Deep Club, favorites live bait. "I've been fishing since I was a kid and the one constant during all that time is that big fish eat little fish," Clark explains. "I like using herring or shiners. Sometimes, early in the morning or at dusk when they are shallow feeding, I'll put a herring on a couple feet below a bobber and sooner or later I'll get a hit. "Later in the day, if its the time of the year when the fish move deeper, I'll have to find where they are suspended and put a herring or shiner at that depth. "Some fisherman like trolling at different depths and some will cast their favorite lures. I'll stay with my live bait." 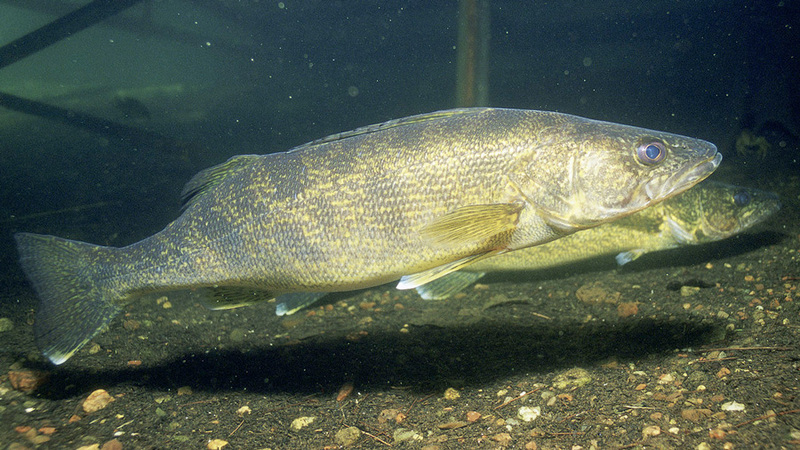 The walleye season is open all year except for the spawning period between March 1 and April 30 when it's catch-and-release only. At all other times, there is a creel limit of three fish of at least 18 inches in length. The only real negatives some anglers have about walleyes is that the fish just doesn't give a good fight once hooked and they are not that much fun to catch. "The biggest fight you'll see concerning a walleye," says one angler, "is who gets that last piece of fish left on the platter at the dinner table." 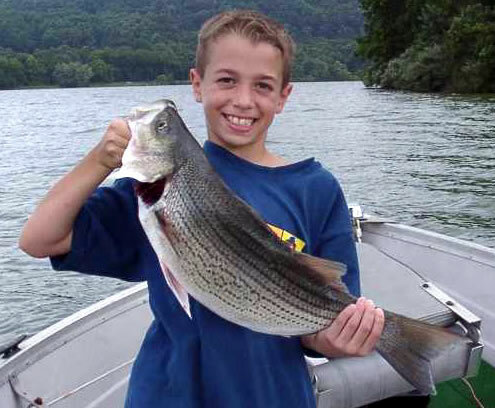 Not so with the hybrid striped bass, a fish that was developed in the mid-60s by originally crossing a female striped bass with a male white bass. Today, there are also hybrids developed from crossing a male striped bass with a female white bass. Known for its strength and fighting ability once hooked, the hybrid bass has provided some excellent sport fishing as well as some very good table fare. But when the new species was first introduced in South Jersey in 1984, anglers didn't express much of an interest in it, preferring to stay with their pursuit of the largemouth bass. A program started in 1990 that featured Lake Hopatcong and Spruce Run Reservoir in Northern New Jersey and most recently Manasquan Reservoir in Monmouth County has proved successful, however, as word got out of the fish's fighting ability. "It felt as if I was backing down on a tuna," says Bill Schmidt of Branchville, who took a half hour to land the state record 16-pound, 4-ounce hybrid bass two summers ago in Culver Lake. "It went on six strong runs ... I was just lucky I had my fishing buddy with me to row the boat after it when it took off." Hybrids need large, clear lakes with deep water and plenty of forage for food. Lakes with an established trout fishery are avoided since both fish prey upon herring and young alewives and it is thought there wouldn't be enough forage to support both species. They will follow baitfish into shallower water in the cooler months of the year but once the weather turns, they head for cooler water at levels where the water starts to change and seek underwater structure and dropoffs. In the winter, they tend not to hold to structure. Fingerlings in the four- to six-inch range have proved to be the most successful in stocking programs. The target stocking number for each lake is ten for each acre of water in the lake. "We've stocked hybrids in Hopatcong since 1984 and continue to do so today as a supplement to what the state puts in," Clancy says. 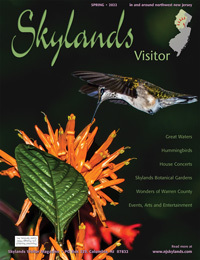 "The goal is 25,000 advanced fingerlings a year and, after the state puts in what it can, we try to make up the rest. "Hybrids have provided some of the most exciting fishing on the lake ... they are the hardest fighter pound-for-pound I've ever come across. Fish from seven to eight pounds are not uncommon. Like the walleye, the best time to fish is early morning and dusk ... we've even had them come up and hit top-water lures at night." Hybrids may be caught year round with a creel limit of two 24-inch or longer fish. wasn't bouncing and I was afraid it was going to break," Schmidt says today, recalling the events of two summers ago on Culver Lake. "I thought I was caught up in the weeds." But a tug on the line resulted in an even bigger tug on the other end, and Schmidt knew immediately he had hooked into something big that day on the private lake located in Branchville. A half hour later, a grinning Schmidt was holding up a huge hybrid bass for his fishing buddy Hiromu Imeda to admire. Even later, the weighing scales at the Stokes Sports Shop on Rte. 206 confirmed what both had known all along: the fish was a state record at 16 pounds, 4 ounces. "I knew the old record was 10-13 and we both knew this fish was way heavier than that," Schmidt says. "It didn't even fit in the landing net, it was so big." Schmidt and his friend Hiromu Imeda had been having a good day and had already landed a dozen hybrids between two and four pounds, seven or eight pickerel and a couple largemouth when the big fish hit.They had just anchored over a dropoff and Schmidt had put a bucktail-shiner combo on the one of his three poles he had rigged with 10-pound test line. His choice usually 6-pound test, but it was a bright, sunny day and Schmidt wanted to fish deep with one pole. He cast the lure out the back of the boat and set the pole down to tend to his other rods. It didn't take long for the fish to hit. "He made about six real good strong runs... at times, it felt as if I was backing down on a tuna," Schmidt says. "We had to up anchor and Hiromu would row after the fish. It was a battle ... it took me a good half hour to bring him in. I was lucky the fish hit on the pole with the 10-pound test ... I was also lucky that Hiromu was with me." When Schmidt and Imeda have the time to make a day out of it, they'll go to Hopatcong, Greenwood Lake, Round Valley, Spruce Run or Monksville Reservoir. It's when he has only an hour or two to fish that he'll hop in the rowboat at his in-laws and fish the 550-acre Culver Lake, which is practically in his backyard. Often, he'll take one or both of this sons ,10-year-old A.J. and Hank, 5, with him. "We have been stocking hybrids at Culver for only a couple of years so this fish had to have come from one of the neighboring lakes, probably Owassa," Schmidt says. "The state did a scale analysis that showed the fish to be about nine years old." An amateur taxidermist, Schmidt stuffed the fish himself, and it now hangs in the living room of his home. He also has a framed certificate that the New Jersey Fish and Game Commission sent him proclaiming he had set a state record for hybrid bass. "You know, even now when I look at the fish, I still can't believe I caught it," Schmidt says. "But it's there on the wall ... and it does look good." A lot better than the weeds he thought he had.